tobacco half-leaves or pieces of tobacco leaf making up the inside of a cigar. standard cigar size with a 16.67 mm diameter i.e. 42/64ths inch, called a 42 gauge, and 140 mm length. 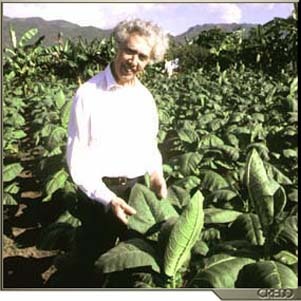 the other denominations (Lonsdales, Rotchild, Churchill), do not have precise significance and are used by the brands. the taste receptors in the mouth are capable of distinguishing four types of chemical bodies that correspond to four tastes: sweet, salty, acid and bitter. olfactory richness, i.e. the variety and quality of the odours contained in the smoke, is thus the second essential characteristic of a cigar and is used to judge the complexity and variety of olfactory sensations in the smoke. persistence: characteristic of smoke whose olfactory form remains largely present. balance: this is the supreme quality in a cigar whose various constituents combine perfectly. volume (olfactory): judgement of the olfactory capacity and presence of active ingredients (nicotine) in the smoke. " the regularity with which a cigar burns along its entire length is one of its essential qualities. Irregular burning is a sign that the tobacco is uneven. . Combustion rate, which varies according to the variety of tobacco, depends on the level of humidity and compactness of the cigar.